The name of your Facebook fan page cannot change once it reaches 200 fans (likes). This is what we all know about changing names of Facebook fan pages. However what if you genuinely want to change the name of your Facebook fan page due to various reasons, including but not limiting to things like a small typo in your page name, or change of business names? There can be several such legitimate reasons why someone would want to change the name of their Facebook fan page. In my career I have faced this questions multiple times from my clients; ‘How to change the name of my Facebook fan page after it reaches 200 fans?’ or ‘can I change the name of my Facebook fan page?’ I used to say this is not possible, unless you get hold of someone at Facebook directly to do this. However, lately Facebook has enabled a new option which allows page admins to change the name of their Facebook fan pages. Good news right? Now hear the bad news (read on, I have another good news after this). As of today (21st April 2015), this feature is only rolled out for page admins residing in USA, Canada and a very limited list of other countries. If you are a Facebook fan page admin based in Sri Lanka, India, Pakistan or any other Asian country you will not be able to access this facility through your admin panel. Let’s get to the other good news. I managed to get the name of my blog’s Facebook fan page changed! As you already know, I’m based out of Colombo Sri Lanka but still I managed to get this done. 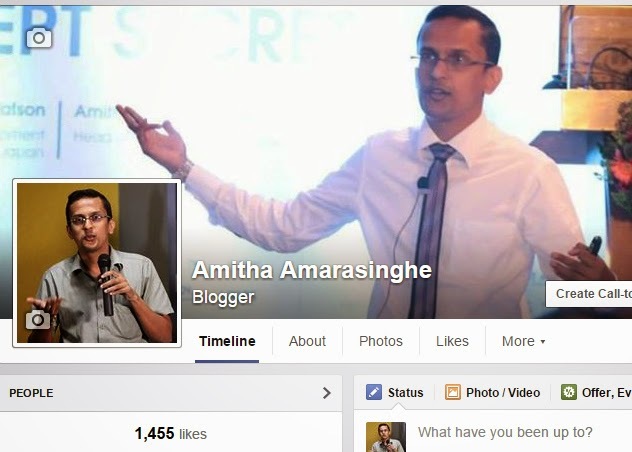 Facebook fan page of my blog used to be “Amis Space – Marketing 2.0” but if you check the fan page now, you will see the page name is now changed to “Amitha Amarasinghe”. How did I do this? How did I change the Facebook fan page name after reaching more than 200 fans (1,450 to be precise)? There is a small workaround which I am happy to share with you, but I will only share the trick with those of you who are really interested knowing it. If you practically have a requirement to change the name of a Facebook fan page, all you have to do is dropping me a tweet on @Amisampath. If you are not on Twitter, the second method is to leave a comment or a wall post on my Facebook fan page. If all these two methods are not working for you, the last option (least preferred for me) is to dropping me an email to the address encoded in “Contact Me” tab on this blog. I’m very slow to respond emails, so first two options would probably work faster. NOTE: I'm not going to charge you a service fee or anything for sharing this work around. You may find this same method elsewhere on the internet. My past experience is, once you share something like those too often on too many sites, 'someone' will introduce a fix for that workaround. That's the reason why I don't want this to be published publicly on my blog.